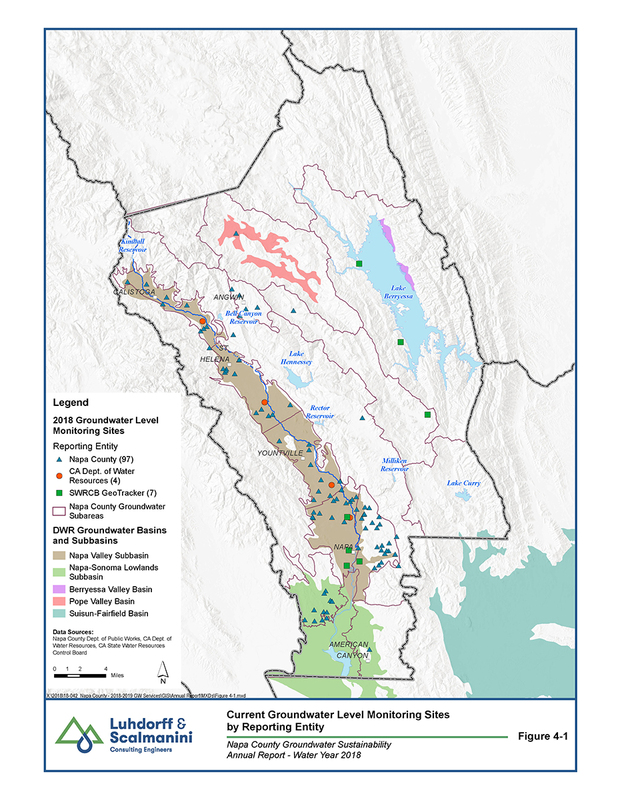 Given the importance of sustainable groundwater resources in Napa County, long-term, systematic monitoring programs are essential to provide data that allow for improved evaluation of water resources, conditions, and to facilitate effective water resources planning. Groundwater data availability in Napa County varies widely among the subareas. The bulk of the historical and current groundwater level and quality data is located in the Napa Valley Floor Subareas. Recent efforts have expanded the geographic extent of data collection to other subareas. In 2018, groundwater level data was available for 108 sites throughout the county, including 13 of the 17 groundwater subareas and 61 sites within the Napa Valley Subbasin. In 2018, the Department of Water Resources resumed monitoring efforts at four wells that had been suspended in response to multiple, large wildfires that burned in many areas around Napa County in October 2017. The majority of these sites were privately owned wells volunteered by their owners and monitored by Napa County. Here is a video that highlights the importance of the program and the data collected. Precipitation was below average for the 12-month water year that ended in September 2018, based on records from the long-term rain gauge at the Napa State Hospital. The precipitation total for water year 2018 was 19.3 inches, while the average water year total from 1920 to 2015 was 24.86 inches. The most recent water year with similar precipitation total was 2014. 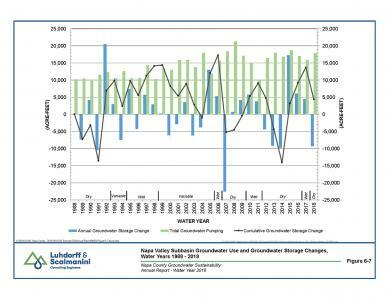 Groundwater level trends in the alluvial aquifer system of the Napa Valley Subbasin of the Napa-Sonoma Valley Groundwater Basin are stable in the majority of wells with long-term groundwater level records. Spring 2018 groundwater levels were generally somewhat lower compared to spring 2017, which was a Very Wet year. Overall, despite the reduced recharge potential in 2018 due to Dry year conditions (19.3 inches of rainfall), groundwater levels in fall 2018 remained comparable to levels in recent years. Groundwater levels in spring and fall 2018 were also generally above levels recorded in 2014, the most recent water year with a similar annual precipitation total. 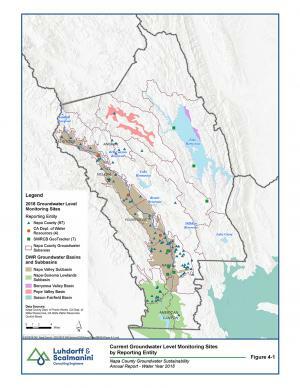 Although designated as a groundwater subarea for local planning purposes, the majority of the Milliken-Sarco-Tulucay (MST) Subarea is not part of a groundwater basin as mapped by the California Department of Water Resources (DWR). Groundwater level declines observed in the MST Subarea as early as the 1960s and 1970s have stabilized since about 2009. Groundwater level responses differ within the MST Subarea and even within the north, central, and southern sections of this subarea, indicating that localized conditions, whether geologic or anthropogenic in nature, might be the primary influence on groundwater conditions in this local subarea. An expanding recycled water distribution system in the MST subarea, supplied by the Napa Sanitation District, delivered over 250 acre-feet of recycled water to users in the MST Subarea in water year 2018. Increased use of this new source of water along with continued land use permitting constraints are expected to aid in maintaining stable groundwater level conditions in the MST subarea in the future. In the past several years, Napa County has developed a more focused understanding of the geology that controls the occurrence and availability of groundwater. With this updated geologic information and with assistance from community members serving on the Groundwater Resources Advisory Committee, the County expanded the number and distribution of wells that it monitors through a concerted effort to improve the understanding of groundwater resources countywide. Between 2011 and 2015 the number of County monitored wells increased from 47 to 100. In 2018, Napa County monitored 96 wells. 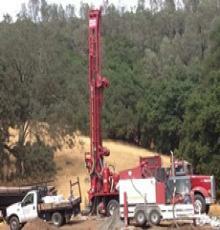 One new well was added to the network in the Calistoga subarea near the margin of the Napa Valley Subbasin where surficial alluvial deposits transition volcanic rock formations. Part of the monitoring network expansion in recent years occurred through the construction of ten dedicated monitoring wells at five sites in Napa Valley, designed specifically to provide data on the interactions between groundwater and surface water. Despite the recent monitoring network expansion, there are additional areas where data are lacking and additional wells are needed to fill data gaps. To request more information on options for including your well in the County’s monitoring program, please contact Patrick Lowe, Napa County Natural Resources Conservation Manager, at (707) 259-5937. 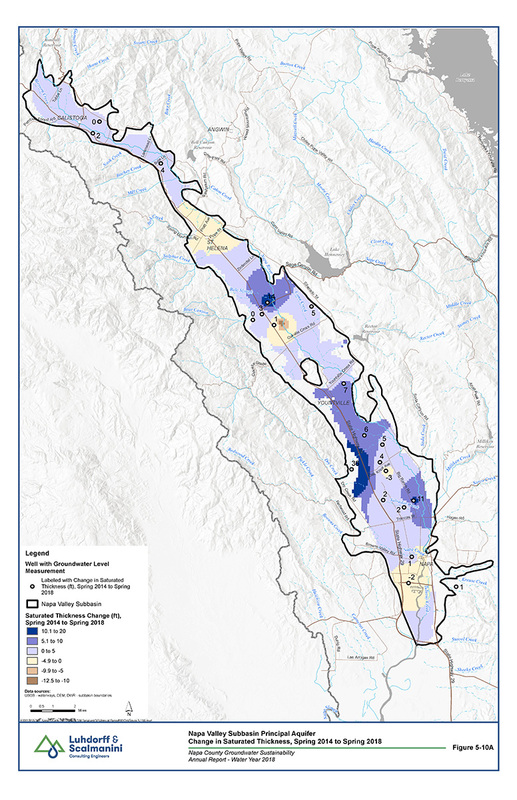 The Basin Analysis Report for the Napa Valley Subbasin provides an updated sustainability goal for the Subbasin based on the requirements of SGMA (LSCE, 2016c). The Basin Analysis Report meets the functionally equivalent standard for alternatives to a Groundwater Sustainability Plan (GSP) in part by updating sustainability criteria for the Napa Valley Subbasin in conformance to the definitions provided in SGMA. 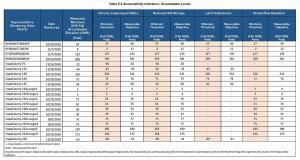 To evaluate the condition of the Subbasin in relation to the sustainability goal, the sustainability criteria include measurable objectives and minimum thresholds developed to avoid the six undesirable results identified in SGMA (LSCE, 2016c). For SGMA purposes a “measurable objective” is a “specific, quantifiable goals for the maintenance or improvement of specified groundwater conditions” (Section 351). SGMA additionally defines a “minimum threshold” as “a numeric value for each sustainability indicator used to define undesirable results” (Section 351). 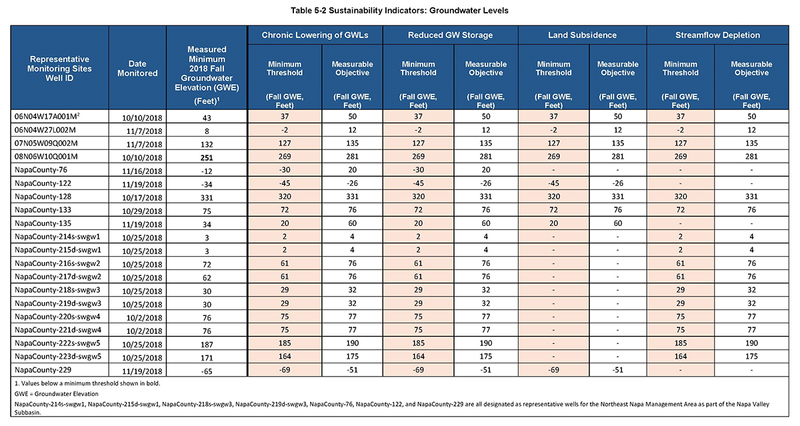 Groundwater levels recorded in 2018 were above the minimum thresholds established as sustainability criteria for 19 of 20 Sustainable Groundwater Management Act (SGMA) Representative Wells with water level criteria. The reduction of groundwater levels below the minimum threshold at one of twenty SGMA Representative Wells, 08N06W10Q001M, is most likely an indication of the effect of Dry year conditions. Two other wells in the vicinity, NapaCounty-224 and NapaCounty-225, did not experience similar groundwater level conditions in fall 2018. Subsequent monitoring has found that water levels in well 08N06W10Q001M increased throughout the winter of 2018-2019, even before substantial rainfall occurred. In response to the fall 2018 groundwater level in well 08N06W10Q001M, the County is reviewing conditions in the vicinity of the well including water use and the location and operation of nearby wells. 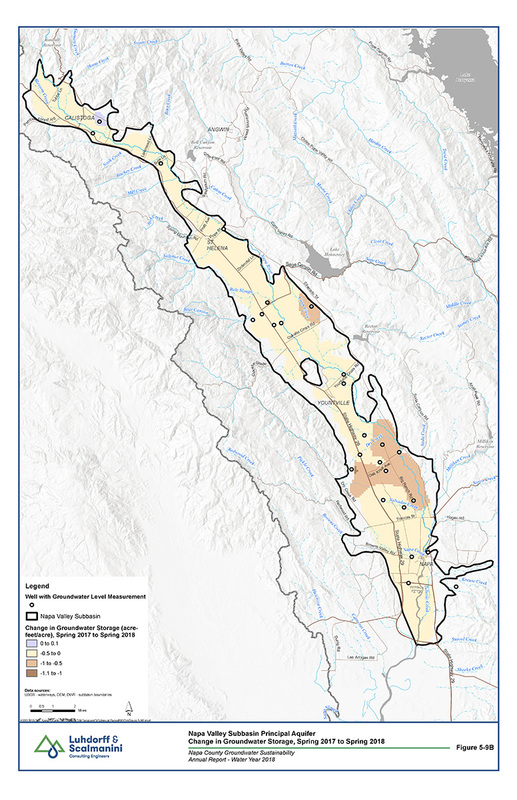 The measurable objectives established in the Basin Analysis Report for the Napa Valley Subbasin provide a reasonable margin of operational flexibility under adverse conditions where applicable and utilize components such as historical water budgets, seasonal and long-term trends, and periods of drought. Groundwater elevations serve as the proxy for multiple sustainability indicators where reasonable. 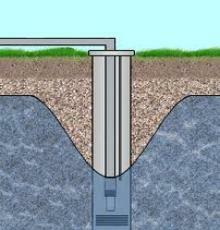 For representative monitoring sites where, long-term periods of record are not available, as in the case of the dedicated monitoring wells constructed in 2014, which were developed specifically to monitor groundwater-surface water interactions, measurable objectives established at these facilities will be reviewed and reevaluated as appropriate, as the collection of available data for each site expands to better reflect true long-term variability at those locations. Consistent with the Dry water year conditions, the volume of groundwater in storage in the principal aquifer system of the Napa Valley Subbasin decreased in spring 2018 relative to spring 2017. The volume of groundwater in storage declined in 2018 by 9,314 acre-feet to a total of 209,984 acre-feet. 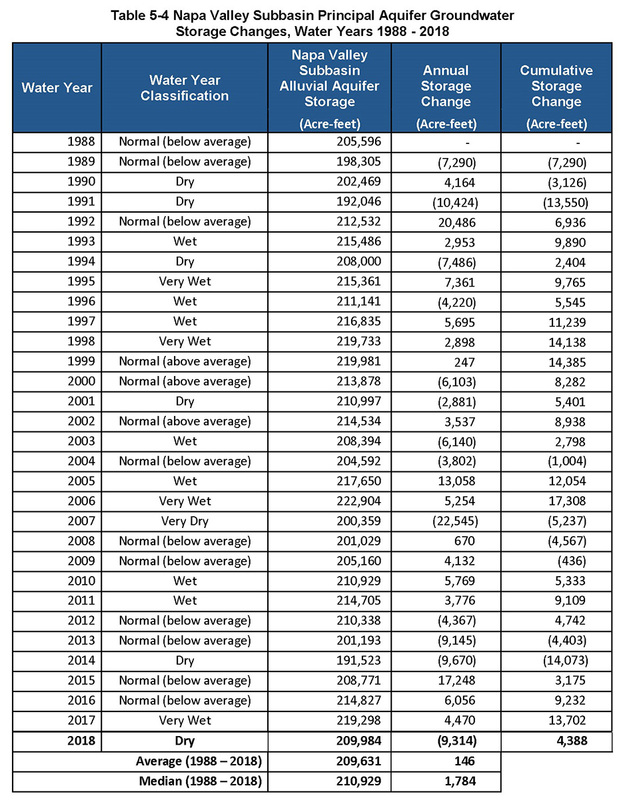 From 1988 through 2018, cumulative annual storage increased 4,388 acre-feet, reflecting a basin in balance and the absence of long-term depletions of groundwater storage within the Subbasin. Maps of saturated thickness and groundwater storage changes in the principal aquifer system show decreases in saturated thickness and groundwater storage throughout most of the Subbasin between spring 2017 and spring 2018. These decreases are consistent with the reduction in precipitation between 2017 and 2018. Larger decreases in saturated thickness occurred along Dry Creek and in the vicinity of Oak Knoll Avenue. 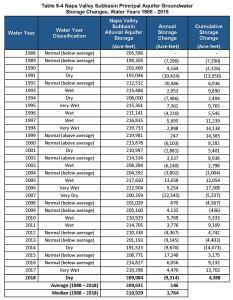 Notably, the reductions in groundwater storage were variable over that area. For example, near the dedicated monitoring well at Dry Creek near Highway 29 declines were much smaller than in the active supply well monitored to the west near the Subbasin margin. This latter observation highlights the value of dedicated monitoring wells. Changes in saturated thickness of the primary aquifer and groundwater storage volume changes were also evaluated for the period from spring 2014 to spring 2018, for comparison with the most recent year with a similar precipitation total. Saturated thickness and groundwater storage were greater in spring 2018 than in spring 2014. Spring 2018 saturated thickness was generally 0 to 10 feet greater than the saturated thickness in spring 2014. Total water use in the Napa Valley Subbasin, including groundwater extracted from the Subbasin, surface water from sources within the Napa River Watershed, and imported surface water delivered through the State Water Project, is estimated to have been 37,174 acre-feet in water year 2018. Total estimated groundwater extraction in the Subbasin was 17,889 acre-feet. As noted above, groundwater storage volume decreased in 2018, by 9,413 acre-feet. 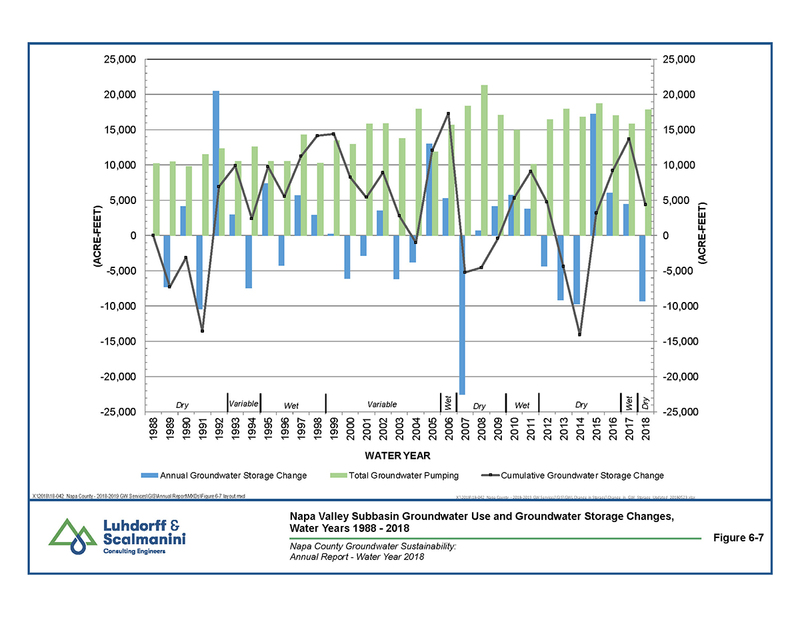 Cumulative changes in groundwater storage show a net increase of 4,388 acre-feet from 1988 – 2018 in the principal aquifer of Napa Valley Subbasin. Groundwater extraction in water year 2018 was comparable to amounts used in recent years dating back to 2004. Over a full 30-year period, annual storage changes in the aquifer system have fluctuated between positive and negative values, generally in accordance with the water year type. Cumulative changes in groundwater storage have also fluctuated between positive and negative values, indicating long-term stable groundwater storage conditions, the absence of chronic depletions of groundwater storage, and an overall condition of a basin in balance. Groundwater extraction in the Subbasin in water year 2018 remained within the sustainable yield range of 17,000 to 20,000 acre-feet per year identified in the Basin Analysis Report. 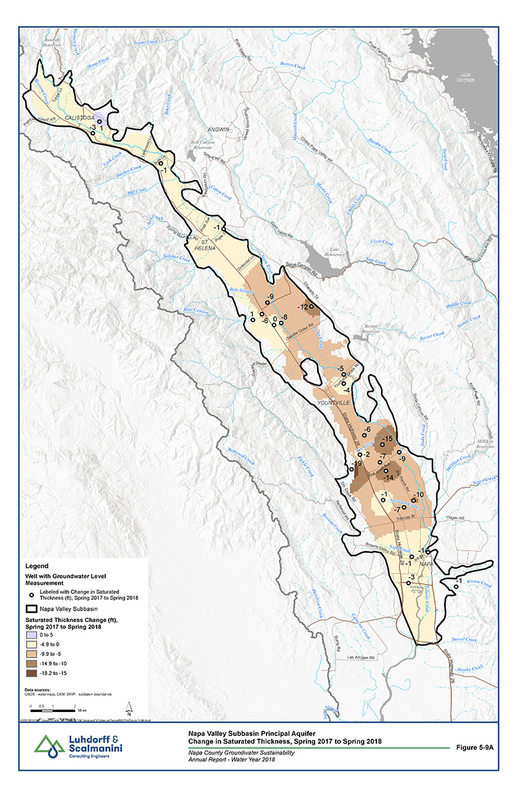 Together, the findings presented in this report regarding groundwater conditions at representative monitoring sites, changes in groundwater storage, and groundwater extraction demonstrate that the Napa Valley Subbasin has continued to be managed sustainably through 2018. 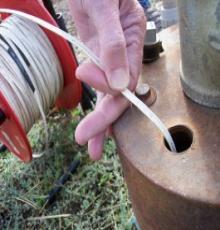 To navigate to groundwater subarea pages, use the links below. Links can also be found in the popups when clicking on certain subareas in the interactive map.